Award winning author, Cathy MacPhail, visited 3rd year pupils to share her experiences of becoming published, the sources of her plots and the trailer for the recent film made from her first novel, Another Me. Along the way, Cathy managed to get the pupils to imagine the spookiest things that could happen in the room they were in, and volunteered one of the pupils to be at the receiving end of all this trauma (sorry, Gemma!) From unseen voices, flickering lights and echoing footsteps, it wasn’t clear if her victim would get out alive! Fortunately all had survived by interval, and we took Cathy off for some discussions with coffee and senior pupils. Advanced High English now includes a Creative Writing element, and the class appreciated Cathy’s insights into character, plot and how to get writing. Many thanks to Cathy for all of her advice and stories. 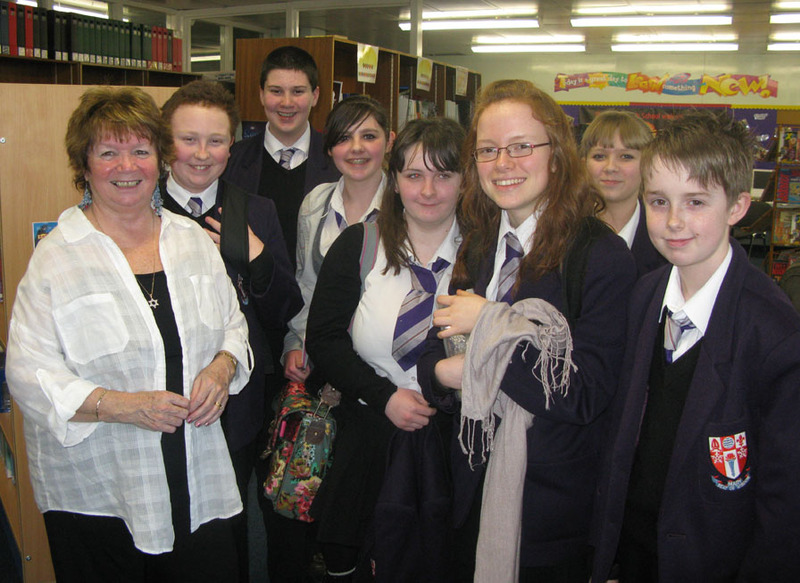 We look forward to welcoming her again in 2016 to discuss writing with S2 pupils. Author, Cathy MacPhail, will be coming to talk to S3 English pupils on Friday 4th December. 3rd year pupils complete an Added Value Unit on a topic of their choice on Scottish mysteries, which also involves Library lessons on research, copyright and plagiarism. Cathy MacPhail is renowned for her fiction inspired by Scottish folktales and stories and will provide an excellent boost to the work. Pupils may also choose, if they wish, to buy one of Cathy’s books and ask for it to be signed, but there is no requirement to do so. Please see Librarian, Mrs Macfadyen, for further details. This visit has been organised by Mrs Macfadyen with financial support from the Scottish Book Trust Live Literature Scheme. Thirty pupils from 3rd year took part in the inaugural YAY YA+ event at Cumbernauld Theatre, which celebrated Young Adult authors living and working in Scotland. Organised by author, Kirkland Ciccone, pupils had the opportunity to meet with authors, Cathy MacPhail, Theresa Breslin, Barry Hutchison, Linda Strachan, Lari Don, Alex Nye, Matt Cartney, Roy Gill and Victoria Campbell. Pupils found the discussions between authors fascinating, especially since they often didn’t agree with each other, and provided a range of views on how to write, what to read and whether to read the book before seeing a film! The selfie station was well used and there were plenty of photos and autographs collected. Further reports will appear on the Library blog. OLHS pupils in 3rd and 4th year won a competition back in October at the North Lanarkshire Catalyst Book Awards 2011 for the best use of the Catalyst blog. Their prize was a visit from award winning author, Cathy MacPhail. The classes were enthralled by Cathy’s stories of moving statues, haunted hotels and creepy libraries. The Creative Writing Club also discussed lots of ideas with Cathy and sought advice for their own writing. Cathy was kind enough to answer all their questions and even set them a writing challenge at the end of the afternoon.